Sun-North designs and distributes high performance and energy efficient wall mounted exhaust fans from as small as 12” to as massive as 72” in diameter. 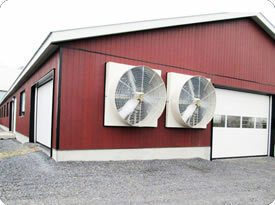 The larger fans are ideal for tunnel and cross ventilating dairy, poultry, and swine barns, green houses and industrial applications and are noted for their quiet operation. The fan housing is made of corrosion resistant fibreglass (available in poly in some sizes). Fan motors are high efficient and totally enclosed. They are either direct drive or belt and pulley with heavy duty bearings. The fibreglass outer exhaust cone on each fan does not protrude out the same distance as many other competing fans, ensuring less wind scoop and less fluctuation of exhausted air.